Deer hunters will soon be out in full force and a wildlife research supervisor with the Iowa Department of Natural Resources is reminding those hunters who are successful to report their hunt to the state’s harvest reporting system. Chris Ensminger says around 20-percent of hunters who kill a deer fail to report it to the DNR. “They mean to do it when they get home, but undoubtedly after a full day of hunting, they’re tired and hungry…next thing you know, you’re falling asleep in front of the TV. So, the next day comes and they’re busy…and they just forget,” Ensminger said. The reported harvest is an important piece of information used when wildlife experts discuss possible changes to seasons, antlerless quotas, or other potential regulation changes. Hunters who are caught failing to report within 24 hours of the deer kill can face a fine and court costs of roughly $80. 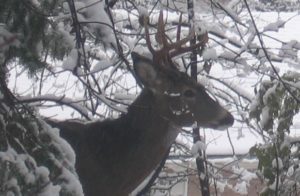 The first of Iowa’s two shotgun deer seasons opens on December 3.